In February of 2018, I participated in the AHAA panel at the College Art Association. The AHAA session theme was “America Is (Still) Hard to See: New Directions in American Art History.” The title was based on the Whitney Museum of American Art exhibition, America Is Hard to See, which was lauded for “fresh perspectives” and the representation of African American artists, but which included only one Native American artist.1 There continues to be a lacuna around Native American art in art history textbooks and in the worlds of “American art” writ large. But even within my sub-discipline of Native American art history, there are other issues that are “hard to see.” I want to look at the issue of intangible cultural heritage, which has become invisible due to the incessant art-historical focus on that which is tangible and visible. To start, some history: in December 1921, a Kwakwaka‘wakw chief, Dan Cranmer, held a potlatch on remote Village Island, on the central British Columbia coast. Some say it was the biggest potlatch on record, with witnesses receiving unprecedented amounts of payments as many inherited privileges were passed to the next generation. But the Canadian Indian Act prohibited potlatching in Canada from 1885 to 1951. Consequently, forty participants were arrested and twenty-two were sentenced in the Provincial Courthouse in Vancouver. Faced with the untenable choice of going to jail or surrendering their potlatch regalia—masks, blankets, and coppers—some of the accused gave up their wealth, and the confiscated goods were sold to private collectors and museums. Although the potlatch ban was lifted in 1951, the repercussions echo to this day. Museums that hold collections often unethically acquired during those dark years must now work to re-earn the trust of affected communities. In 2008, Kwakwaka’wakw artist Marianne Nicholson’s House of Ghosts illuminated the façade of the Vancouver Art Gallery, which is housed in what was the Provincial Court House. Nicolson’s thirty-foot wide projection imposed the lintel and house posts of a Kwakwaka’wakw Big House, transforming the colonial site of the potlatch prosecutions into a virtual place of convening for the spirit and human world. House of Ghosts was intended to make people see the histories that are still hard to see, even if they are etched into the land under our feet and the buildings through which we walk. Her work asserts the ongoing presence of First Nations communities and their powerful resistance to colonial abuses. The work asks us to consider if art can reclaim space. But as powerful as it was, Nicolson’s work was only a temporary intervention. The digital projection effected no tangible change to the building. Nicolson claims that her work transformed the Vancouver Art Gallery into a Big House, but concomitantly it highlights the fact that the museum cannot be an actual Big House, and points to the failings of museums and institutions. The visual nature of most museum exhibitions of Northwest Coast work turns familial property into art and hides the critical histories and intangible connections that should inhere to cultural creations. As Nicolson notes, it is the performative act of singing and dancing in ceremony that animates much First Nations art through the interaction of object, actor, and audience. In that moment, meaning is co-constituted by the knowledge of all those involved—carver, singer, dancer, and witnesses. Museums excel at spotlighting the visual aspects of art but struggle to engage the fundamental sensorial and performative aspects of art tied to movement, song, and language. When objects are removed from their performative contexts, as is often the case in museum displays and text-based art-historical inquiries, their cultural meanings are deactivated, and they become artifacts of the dynamic moment of meaning. By way of example, when this frontlet, a carved piece attached to a headdress with a long ermine-skin trailer (fig. 1), was sold to a collector in 1965, it was ripped away from the genealogical connections and inherited privileges that had catalyzed its public presentation during ceremonial gatherings in community. Research has brought to the surface the latent connections of the physical object to the intangible wealth of the community from which it originated. In this instance, the frontlet appears in an 1898 photo of Charles Nowell’s wedding, an event during which it and other family regalia and tangible wealth were used to transfer names, songs, dances and other intangible property, rights, and privileges, many of which are still held by Nowell’s descendants. This same headdress also appears in a unique archival document from 1930—films made in the village of Tsaxis (Fort Rupert) by Franz Boas and George Hunt with members of the Hunt, Martin, Wilson, and Williams families (fig. 2). The film shows this headdress being worn by dancer Lucy Martin Nelson. 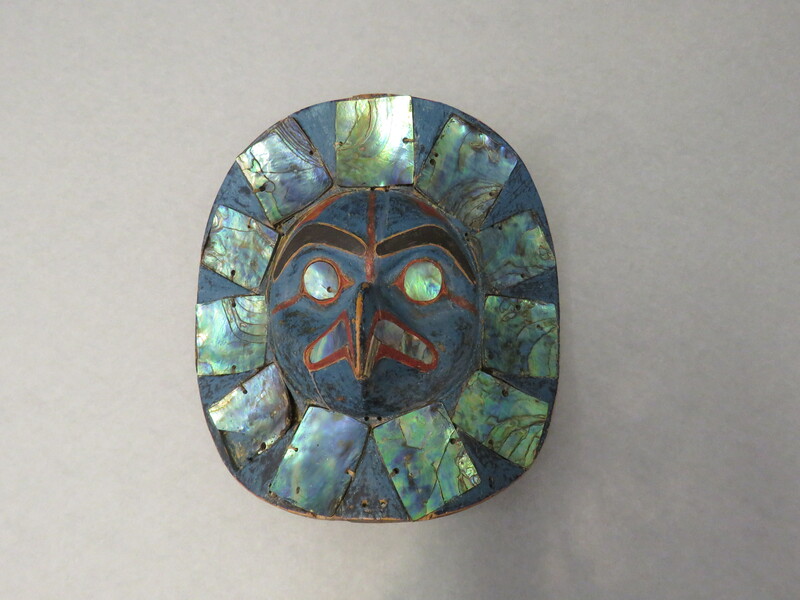 It is a rare document of the frontlet actually in use, in a dance during the Canadian government’s potlatch ban and only eight years after the potlatch prosecutions in 1921. In 1955, Kwagu’ł chief Mungo Martin watched the film, recognized his daughter’s dancing, and recorded the song that was meant to accompany it. Together the film and audio provide a rare glimpse of this frontlet in a dance, its rhythm and movement as well as the performative kinship connections and inherited privileges that were validated when it was danced. This frontlet is just one example that demonstrates the complicated relationships between object, dance, song, and—perhaps most importantly—genealogical connections. It also illustrates the fraught nature of archival materials and the methodological challenges to art history in uncovering the connections that material objects have with intangible cultural property. The archival material on this frontlet comes from five different museums and archives, but most importantly, that material has been reconnected with knowledge from the Hunt, Martin, and Wilson families and other community members who were consulted over time by Franz Boas, Erna Gunther, Bill Holm, and myself. This collaboration has clarified the record of the frontlet. As caretakers of this knowledge (such as records of songs, dances, and names) and as caretakers of the collections of physical objects, museums must work with communities to determine how their cultural property (both tangible and intangible) will be cared for.5 How should issues of access and authority, consent and rights management, be handled with the Indigenous communities to which this heritage belongs?6 How can institutions that hold these fragments of knowledge work collaboratively with community necessary to reunite them? Digital publications have a unique capability to implement an art-historical approach to the visual object while integrating film, oral history, and song to activate the performative contexts and intangible rights and privileges that are key to robust analyses of these artworks.8 We can attempt to acknowledge, understand, and preserve the intangible materials that crucially inform the physical objects in museum collections, and—most importantly—we can engage in robust inquiries led by community priorities. These steps are critical for publications as well as museum practices. We have the technology. It is time to get to work. Cite this article: Kathryn Bunn-Marcuse, “Textualizing Intangible Cultural Heritage: Querying the Methods of Art History,” introduction to Bully Pulpit, Panorama: Journal of the Association of Historians of American Art 4, no. 2 (Fall 2018), https://doi.org/10.24926/24716839.1659.